Avo Coilovers with price, and photo. Hi guys, some of you may have seen this post, but now its official. 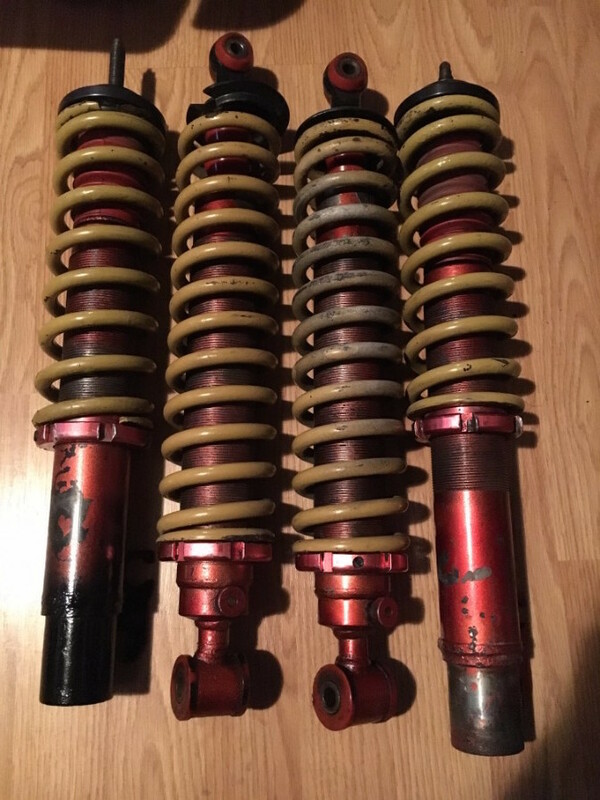 These coilovers were purchased from the UK, and they cost me a fortune. They were leaking when they arrived, and I never saw any compensation from the seller. I inquired to AVO about getting them rebuilt, its not too bad, but I decided since I already had so much invested in these I would cut my losses and buy new ones. These are height adjustable and dampening. I would like 400$ nego plus shipping for them. Much, Much less than what I paid considering the exchange rate. I can get a pretty good shipping price too. This is the info AVO gave me about the rebuild. send in it to us, include a note with name address and contact number, once done we ring you for payment and we return units, turnaround time is 5-10 days"
It would be around 230$ US for the rebuild, maybe a bit more. That would make about 630$ + shipping for a set of fully rebuilt coilovers. I know people pay much more than that for just fronts. Also I would be interested in some trades or partial trades + cash. Pimpx, ported head, ported upper/lower intake.